The Green Lama show is an adventure series broadcast shortly in 1949. 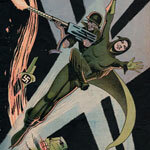 The Green Lama was an American pulp magazine hero- a costumed crime fighter- of the 1940s. The Green Lama, Jethro Dumont, is a rich businessman who resides in the New York City. As an aspiring Buddhist, Jethro Bumont travels to Tibet in order to become a lama (Buddhist Spiritual Teacher). Endowed with superhuman powers, Bumont fights for justice and helps those who are wronged. Although the series was short-lived on the air, it's an excellent production with great sound effects and well-told story lines.